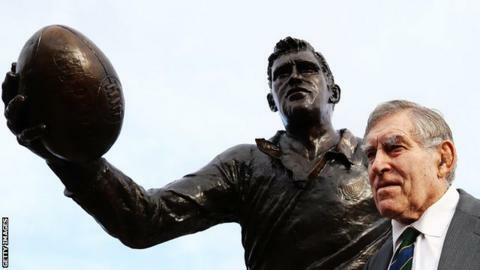 All Blacks great Sir Colin Meads, who was named New Zealand's best rugby player of the 20th Century, has died of pancreatic cancer, aged 81. The former second row played 55 Tests within 133 games for the All Blacks between 1957 and 1971. He was diagnosed with cancer in 2016 and his wife Verna had told local media on Saturday that he was seriously ill.
"This is a sad day for New Zealand rugby and for New Zealand," said the country's Prime Minister Bill English. "I have had the privilege of getting to know Sir Colin. He was not only a great All Black but also a genuinely good New Zealand bloke. "He represented what it means to be a New Zealander. He was no-nonsense, reliable, hardworking, warm and very generous with his time." Meads, nicknamed Pinetree, was knighted in 2009 as recognition of his achievements as a rugby player with the All Blacks and for his charitable work. He was given a statue in his home town, Te Kuiti, in June 2017. "I remember when I was younger hearing stories about how he used to shear sheep all day and go running at night," English added. "I thought I'd give it a go. I quickly learned the Meads legend was built on physical and mental toughness. "My thoughts are with Sir Colin's wife Lady Verna, and his family and friends at this time."